This unique little robot comes with a whole host of additional features. Firstly it comes with full audio and visual streaming capabilities, so, you guessed it, even when you’re away from home you’ll be able to annoy your pet dog or cat for pure amusement. You can check you haven’t left the oven on, and what’s more, because Rovio comes with a microphone and video camera, you can also video chat with mates, family or even colleagues at work. Rovio’s casing houses a rechargeable battery that can charged via it’s own charging station and because it knows where it is, it can can recharge itself all on its own. No doubt there are a a multitude of uses for this cool little robot. 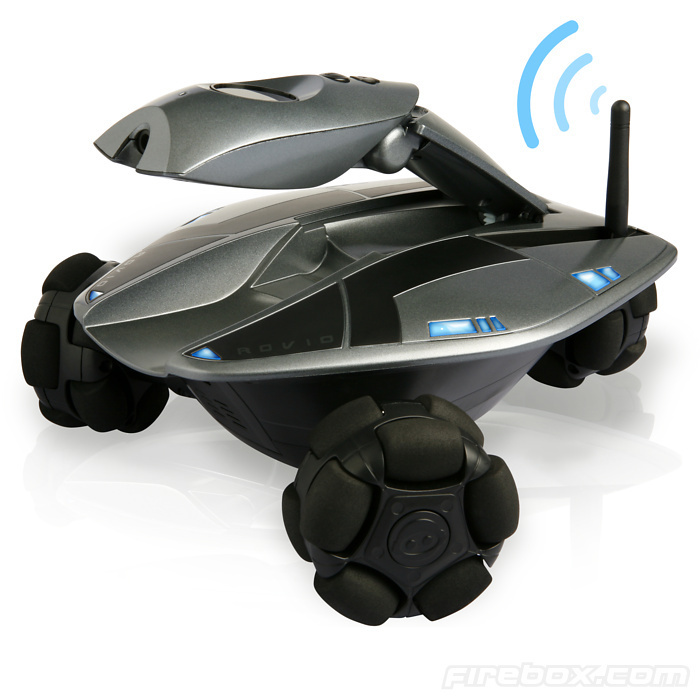 Below we’ve included a short video showing Rovio – the wireless robot in action. The great thing about Rovio is how versatile it is. Most web browsers currently available will work just fine. You can take quick snapshots at the touch of a button while roaming around home. You can set-up and record routes for Rovio to take along its journey as well as being able to remember its destination if a stray dog knocks it off track while en route. For full specs and features, see below. Rovio is available to purchase now at Firebox.com at a cost of £199.99. With all this you’ll have everything you’ll need to just leave it at home and enjoy! Thats a really good product, i like it, easy to use and fun! !